Derailleur hanger Focus Adventura 2007. 5086 aluminum CNC machined Made in Italy. In actual size 1:1 scale. Derailleur hanger Focus Arriba 2006. 5086 aluminum CNC machined Made in Italy. In actual size 1:1 scale. Focus Arriba 2007 - 2008 derailleur hanger 6061 T651, made with CNC technology. Black anodized. Lighter and more durable than the hanger series. 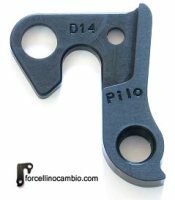 Derailleur hanger Focus Arriba 2011 - 2012. Focus Aventura derailleur hanger 6061 T651, made with CNC technology. Black anodized. Lighter and more durable than the hanger series. 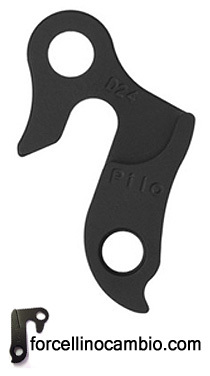 Derailleur hanger Focus Black Forest 1-5 2011 - 2014. 5086 aluminum CNC machined Made in Italy. In actual size 1:1 scale. Derailleur hanger Focus Black Hills 2012. 5086 aluminum CNC machined Made in Italy. In actual size 1:1 scale. Focus Black Raider 2.0 2012 hanger 6061 T651, made with CNC technology. Black anodized. Lighter and more durable than the hanger series. Derailleur hanger Focus Blue Ridge 2008. 5086 aluminum CNC machined Made in Italy. In actual size 1:1 scale.